We #LoveMusic. We #Lovelansing. We know you do too. So Common Ground is a match made for Just B Yoga fans. 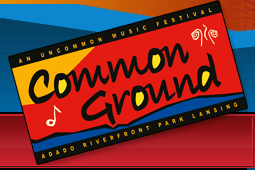 Here’s your chance to get to enjoy all seven days of Common Ground music festival for you and a guest ($160 value). 3) Donate at least $10 to the studio. DUE TO A LACK OF PARTICIPATION WE ARE EXTENDING THE DEADLINE TO 6 P.M. SATURDAY, JULY 9. If you don’t win you get to know you’ve helped support Lansing’s only donation-only yoga studio. We make yoga and tai chi affordable and accessible to as many people as we can. Learn more about how we operate on our Support Us page. If you don’t win you know you’ve helped Just B contribute money to other Lansing agencies, nonprofits and services. We’ve donated more than $700 to local community groups since opening in October 2010.
done, done, done, retweeted, and shared on fb. 🙂 I’ve at least one friend that still needs to get a pass and I’ve actually never gone… so … crossing my fingers!